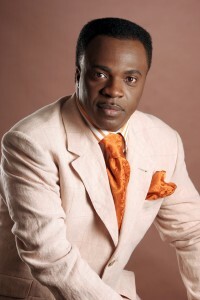 Today, thanks to his weekly exposure on Christian TV, Bishop John Francis is internationally known as a dynamic preacher and pastor of the 5,000 strong Ruach Church in London. Yet the recent release by Integrity Provident of 'Welcome To This Place' by Bishop John Francis & The Ruach Choir brings once more into the spotlight the other ministry of this charismatic Londoner. For John is one of the pioneers of the whole gospel scene in Britain with his Inspirational Choir landing major label record contracts and making TV appearances when gospel was still thought of by the British record industry as a quaint novelty. What is intriguing about 'Welcome To This Place' is that the album is, in fact, six years old. Originally planned to be issued on Viv Broughton's short-lived FAR Records, its release now brings back into the MUSICAL spotlight one of the UK scene's most experienced figures. John grew up a child of the church. His father was the pastor of a church in Islington's White Lion Street. In an interview with Cross Rhythms' Mike Rimmer John spoke about his first encounter with gospel choir music. "The first album that I had that my father bought me was by James Cleveland And The Southern California Community Choir. It was an incredible album. My big thing was, 'I want to go to America! I want to meet this guy! I want to hear the choir!' The turning point for me was actually when I went to the States. I went to a convention and they had different district choirs and singers from all over the country. I was sitting down hearing choirs and singers and I was like, ah, that choir's good! That singer's good! Then I thought, no this one's good! Then I kept hearing another group and I was, no, no, this one's better than the last one! And then, no, no, this one's DEFINITELY.! [laughs] And by the end of the conference I was like, they were gooood! Funnily enough, some of the greatest singers did't even have a record deal. So I was moved and totally blown by the gospel scene and that's how it started." John was particularly impressed by Douglas Miller - a leading COGIC choir trainer whose songs like "Unspeakable Joy" and "My Soul Has Been Anchored In The Lord" were big gospel chart hits in the US. Said John, "Douglas Miller, who was connected with our church, totally influenced me musically. I was trying to sing like him and everything. And then I left there and formed a choir." In the book Black Gospel, John told author Viv Broughton how the Inspirational Choir developed. "It really came initially as a branch of a united choir. The united choir became difficult to cope with because some of us couldn't make it. Those of us who could eventually formed this Inspirational Choir. We began to do a few concerts and it began to come together." In 1982 the Inspirational Choir appeared on a Channel Four gospel talent search Black On Black. John told Broughton, "We came second and thought that was it. But one day I came home and my sister said, 'Guess who telephoned?' It was a guy from the pop group Madness. They wanted us to back them on a song. I said 'no' straight away! I was really against it, at first. But my sister persuaded me that I should wait until I heard the song." When the demo of "Wings Of A Dove" arrived, John found no offence in the lyrics and gave the go-ahead. "The next thing I knew, we were in a studio starting a recording and the song got to number two in the national charts. From there we went and asked the record company whether they'd be interested in signing us up to do something on our own. . . and before we knew it, we were back in the studio." Stiff Records recorded a five-track mini-album of traditional gospel, including a boisterous version of "Do Not Pass Me By", expertly crafted by pop producers Alan Winstanley and Clive Langer out of the choir's enthusiastic but ragged ensemble singing. 'Clean Heart' was released under the flamboyantly long moniker The Inspirational Choir Of The Firstborn Church Of The Living God. The choir began to make TV appearances and, together with the London Community Gospel Choir, became touring ambassadors for gospel music across Europe. In 1986 the Inspirational Choir were signed to CBS. The major threw big money at the choir as they sought to launch British gospel to a mass audience. Yet the albums 'Abide With Me' and 'Higher And Higher' (reissued as 'Sweet Inspiration') were ill conceived projects full of florid arrangements and songs, almost entirely cover versions, many of which were transparently unsuitable for a full-on gospel choir. But even if their albums were seriously flawed, the choir's live appearances were wide and varied from the London Palladium to the Labour Party Rally, and from France to Scandinavia. John was also asked to present Britain's first home grown gospel TV show, People Get Ready. In 1989 the Inspirational Choir recorded a live album though it was nearly two years before 'A Charge To Keep' by Rev John Francis And The Inspirational Choir was released. It was a shame that the tiny Opal Records who released it didn't have the marketing clout of a CBS as it was by far the Inspirational's best recording. By the early '90s other matters were taking precedence for the passionate minister of the Gospel, with John's Ruach Ministries becoming one of the fastest growing churches in Britain. John told Mike Rimmer, "When I started Ruach Ministries everybody was expecting it was going to be a very musical church. They knew the artist John Francis but they didn't know the preacher John Francis. The challenge was with that, people were saying, 'Oh they're only coming down there because they want to be a part of your choir.' I didn't have a choir! I stopped the choir. I stopped any kind of singing. All we had were worship singers who were there. And that was quite deliberate because I wanted people not to be seeing the artist but to be seeing now the other side of me, this ministry side. Which worked VERY well because then I'd gone on television and started preaching. I didn't really sing. Didn't even play or do anything. Recently when I was in America I started to sing and they were shocked! They were like, 'Oh my god, he can sing!' And I'm like, 'Well this is what I did first but you guys don't know it. The British people do.' So it's the reverse. The British people are now seeing the preaching side of me and they're like going, 'Wow, he can preach!' And the Americans are going, 'Wow, he can sing now!'" The 'Welcome To This Place' album, recorded by the Ruach Choir in 2001, was as a result of the huge success of the 'Live In London' album by American gospel superstar Donnie McClurkin. That massive gospel hit was rather mis-titled (it was recorded in Croydon, not London) while the major contribution made by the accompanying Ruach Ministries Choir was only credited in the tiny print on the inner sleeve. But the success of Donnie's album did galvanise John and Ruach into recording an album of their own. Said John about 'Welcome To This Place', "It is more of a worship album to what I would normally do. There's one R&B track, which my daughter INSISTED that I needed to do! And I did that for her. But the idea is - this market is really for your family, your worship. It's gonna be songs that people are gonna sing in church. These are the songs that you will hear us sing in our church on a Sunday and these are songs that people love." In 2004 Warner Music released the album 'Inspirations' credited to The New Inspirational Choir. Very much the brain child of Fame Academy and Pop Idol vocal coaches David and Carrie Grant, 'Inspirations' tried so hard to hit all the bases with a mass audience that it ended up in missing most. David and Carrie selected a batch of well known songs, most of which weren't Christian but quasi-religious and "inspiring" like "Many Rivers To Cross", "(Something Inside) So Strong" and "Let It Be", brought in soloists such as soul diva Jocelyn Brown and one-time-gospel-singer-but-not-a-Christian Mica Paris and with a new version of the Inspirational Choir backing up, tried for a big mass audience hit. Bishop John even contributed a cover of R Kelly's "I Believe I Can Fly". But mercifully for the British gospel scene, the confused farrago that was 'Inspirations' didn't sell. Today, John is very relaxed about his role as a pastor and author. He admitted, "When I was the director on the Inspirational Choir I was a little bit of a tyrant. They didn't like me because for me it wasn't about me liking them it was about them singing real good. I tried it once when I did the church choir. I took them over for a couple of weeks. They sang incredible but I had a lot of people emotionally traumatised by my style of teaching! [laughs] So I decided to decline from being Ruach's director! But the great thing about the church choir now, because they're not professionals they're doing it because they love God. I'm not saying the Inspirational Choir didn't have a sincerity about them but there's a certain kind of pureness and sort of an innocence when Ruach sing. Even though the note might not be right you can just feel the presence of the Lord and the sincerity of what they're doing. So I wouldn't change them for anything because I love it." A powerful worship focus exudes 'Welcome To This Place'. Said John, "What we try to do is bring everybody in a place of worship, understanding God, the glory of God, the presence of God. Singing unto God a new song. There's a song I wrote called 'It Was Good For Me To Be Afflicted' - talking about afflictions. And I think that's more my testimony. I call it 'the preacher's song'. How sometimes we go through some trials and tribulations and persecutions but we can look back and the things that we have gone through actually have moulded character into us and the kind of persons we are. I can turn around and say, just like the song, it was good for me to be afflicted. It was good for me to go through what I went through. Not that I liked it at the time BUT, I can turn around and say, you know what? It brought character in me. It's made me who I am. I'm more understanding. I'm more patient now and I understand God more. I remember when I wrote the song. It was a combination of myself, Nicky [Brown] and my wife. My brother turned to me and said, 'There's a song that I don't quite understand.' He goes, 'What's good about being afflicted?!' And I said, 'Maybe you didn't listen to the whole verses?' Because it says: 'It was good for me to be afflicted/So I may learn your ways/So many times I've gone through life, and the things that I went through/I had to find your will for my life/I struggled to understand, as you fashioned me with your hand/But it was good for me to be afflicted.' It was really my testimony of, gosh I've been through some stuff! People see all the great things I've accomplished but they don't realise, it's been hell! It's been a journey. But I can now look back and say, 'Wow that was good! Thank you for giving me a hard time! Thank you for criticising me! It made me look at myself. It made me perfect myself. It made me redefine who I am.'" greetings to you all hoping and trusting that you are doing fine in the Lord. Thank you so much for the wonderful work of God you are doing until i have touched to contact you and send a request to allow us work under your ministry. May the Lord give you good health and long life to serve His children. I believe that though we live in a very fallen and sinful world, The Lord God has provided a way of escape for us. Through the acceptance of salvation and the cleansing and washing of the blood, we have victory. Thank God for the bloodshed of Jesus and the Holy Spirit. Jesus Christ who came to set us free has left the 5) fold ministry for us. I often wonder where I be without the mouth of a true Prophet. BISHOP FRANCIS, you are my Bishop, prophet, and pastor. PLEASE KEEP ME IN YOUR PRAYERS. My season here in the U.S. is over, and its time to move up and out. May God order my steps, in Jesus name. I hope to see you all very soon, Cassandra Samuel. P.S. I will contact the church concerning my tithes and offerings. every time and day when i hear abaut y predication ,i praiseGOD for y life,family,and y ministry.SIR y her a blessing for all the nation. dear bishop francis,i attented your worship service on 29.05.11 at 6:30. It was an amazing service led by the spirit of God, I have never dance like that b 4, 4 God n I throughly enjoyed it. Bishop i need 2 apologise 2 you, many years ago i used 2 critize u. n refuse 2 watch or even listen 2 u when ever i saw u on tv. so i ask u 2 forgave me as i have already confess this 2 God while i was in your service as i was convicted by the Holy Spirit. May God contuine 2 pour out his anointing n blessing on u. May God increase your ages in this world so that you may continue to always inspire us.Stay blessed! I came with the DOVES ministries under the leadership of Pastor Lynne, and I want you to know that was the started of the change in my life, I saw you again, with the DOVES, in North Carolina, and one night I was sitting there listening to you, and said I'm so full of the Spirit I could trun a flip, and the next thing you know you said to trun a flip, and I want you to know I truned that flip, and my life has never been the same again. I want to thank you, and your wife, for allowing God to use you, oh by the way my husband, and children thank you also. Are you ever going to come this way? I remember attending White Lion Street church a few times back when I was a student, living in London. It was a long way to travel but I remember to this day the songs the choir would sing and the preaching. Today I still talk about Ruach to my friends in Texas. Keep the fire burning Ruach!